Every quaint downtown main street needs a few basics to be successful in serving the community well, typically referred to as the butcher, the baker and candlestick maker. In fact, Small Business Saturday has become one of the most popular and beneficial shopping events to grace our area as we are a demographic of individuals that enjoy gathering together, visiting all of the local hotspots and giving back to the community as a whole. The very idea of shopping locally sparks a very nostalgic image of window shopping as a family and spending time with those closest to us. Westwood Charm Boutique in downtown Martinsburg is bringing all of those sentimental and comfy, cozy feelings that shopping within ones specific community can create. Being downtown gives us an assortment of businesses to frequent, however, what none of us realized is how much we needed a new women’s clothing store that caters to this very demographic of ladies. Personalized and custom attire blends in with high-end market items, along with local, tailor made pieces that are serving the downtown natives well. Without a doubt this is an establishment that we have been longing for! Jillian Wyand’s childhood home was on Westwood Ave. in Baltimore, MD. and the charming name lent muse to the naming of her dream. 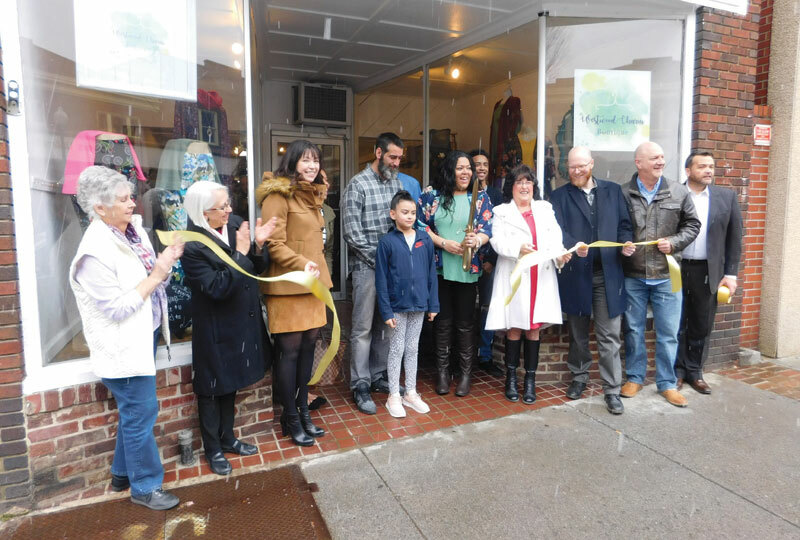 A local, graduating from Hedgesville High School, that is deeply dedicated to the care and happiness of the people here, opened Westwood Charm Boutique in 2017 at a location in Meadow Lane Plaza. After getting her feet wet, Jillian realized that her attention was set on making her solo dream a reality and with the support of her loving husband, Matthew, along with 3 beautiful children, she set out to find a location that suited her aesthetic. Being so customer driven and willing to plunge into serving her community, a downtown location, across from the flower shop, established jewelry store and glass gallery seemed like the perfect location to immerse herself into the demographic of shoppers, and it did not disappoint. Most of us can agree that while it is nice to have the amenities of a large city, there is nothing quite like the tailored help that can be offered by Jillian at Westwood Charm. Red carpet service from the moment you enter the boutique as you will be greeted with a warm salutation, smile and offerings of help. If shopping for clothing is not something that is particularly enjoyable to you, step into Jillian’s ‘office’ and watch her create an atmosphere that is both fun and the perfect remedy to the loathing that clothes shopping can create. With such a warm and hospitable personality, it is easy to assume that you’re in a large metropolis’ high-end, retail boutique, and while the inventory reflects that of an amazingly diverse demographic, it is all at our fingertips here in our rural Eastern Panhandle. Nothing says that your customers are family quite like tracking down and ordering their suggestions along with offering custom printed tops, bags, tumblers and more. Jillian prides herself on how closely she pays attention to the needs of her clients and it more than shows in the reflection of what she offers. From jewelry to carrying local handcrafted leggings, Westwood Charm is invested in catering to all women as a community, not a competition. Carrying the sizes Small to 4XL is incredibly inclusive and as we have arrived into Spring, a wardrobe refresher is needed for most of us. Whether it is a new swimming suit, floral dress for an upcoming event or even a cute bag to carry all of your commuting necessities, Westwood Charm has you covered. No worries if you can’t make it out to shop or if you are a “fair weather friend”, because Jillian still has everything covered with Facebook Silent Auctions. It isn’t always easy around here to get out when the weather goes south, and it was that very thought, one slow afternoon, that gave birth to the idea that if customers cannot make it into her, she will reach out and connect with them, bringing her inventory to their doorstep. It is extremely important to Jillian to go to market in Atlanta every year in the search for new brands to highlight and trending ideas to keep her stock fresh and relevant. This trip along with ordering new inventory every week ensures that Westwood Charm will always have something different when you stop in for a visit. It is with this mentality making the quint little shop feel like an entire, cosmopolitan, experience that is both such a surprise and quite a pleasure to have locally. From maxi dresses, stylish caps, screen printed tees, and a plethora of leggings, all the way to more delicate and feminine business attire, the amount of selection is staggering. All of these hard to make choices come from conversations with the community members and the individuals within it, as Jillian has had an incredible time getting to know her patrons and expanding her reach. 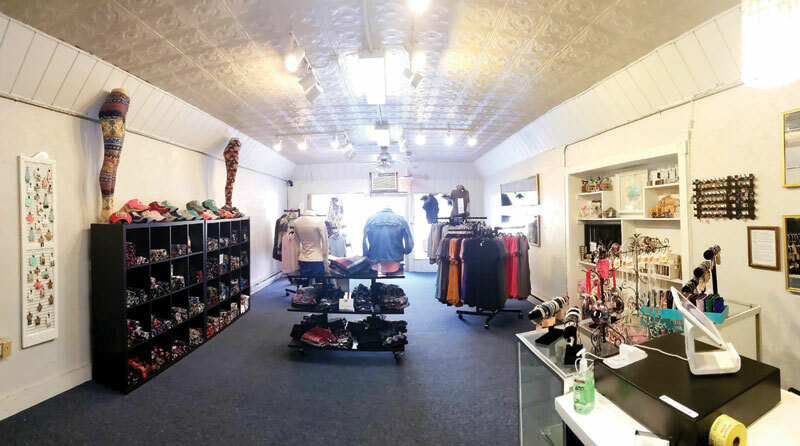 Mainstreet Martinsburg is one of those decisions that solidify Westwood Charm Boutique as a ‘Shop Local’ must have but that also gives us a lot to look forward to. Native and annual events in this area are a must attend and with The Chocolate Festival and Book Faire on April 27th, 2019, Westwood Charm Boutique will be opening their doors to an author and serving fierce deals for the annual event. Cross promotion among businesses is something that Jillian is already a master of, making custom wine bags for Brix 27 (fellow downtown restaurant) and carrying/promoting items from other locals along with creating customized clothing for our home-grown Eastern Panhandlers. It is refreshing and a beautiful change of pace to have a clothing store downtown so invested in the happiness of customers as well as ensuring that our city is represented by the very best in our community. Jillian and her family are making it their business to provide a service that we are not yet spoiled by and can appreciate for years to come. If you find yourself downtown please stop by 145 N. Queen Street, Westwood Charm Boutique, open everyday except Sunday, or visit online at www.facebook.com/westwoodcharmboutique to get a glimpse of the beauty and wonder waiting for you.